OutRun 2006: Coast 2 Coast was delisted from Steam no later than Autumn 2013. This is based on Steam Community discussions and tweets found in August and October of 2013. Similar to OutRun Online Arcade the game was most likely delisted due to expired licensing from Ferrari whose cars feature heavily in the game. 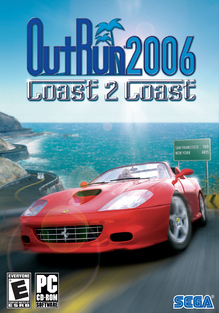 OutRun 2006: Coast 2 Coast remains available on physical media but its online servers were shut down between 2009 and 2010. Online Multiplayer madness – take on 6 other drivers online!